The Rupp House History Center began the 2019 season Friday, April 5. 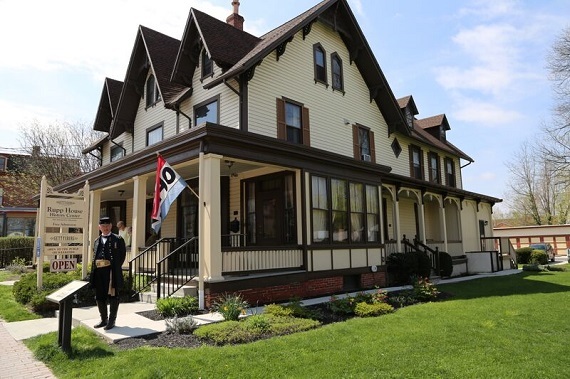 Hours are Fridays and Saturdays, Noon to 8 p.m. and Sundays, Noon to 5 p.m. Visit GettysburgFoundation.org for details on the Rupp House’s hours and special programs throughout the year. The Rupp House, home of the John Rupp family in 1863, tells the story of civilian life during and after the Battle of Gettysburg. Visitors to the Rupp House can explore, touch and learn through interactive displays and exhibits, and participate in a historical scavenger hunt. Visitors have an opportunity to mingle with historians on the grounds each summer weekend. The Rupp House History Center, offering free admission, is located at 451 Baltimore Street, Gettysburg. Learn more about the Rupp House History Center.